I hadn’t planned to cook. Well, not cook from scratch. I had to work over the weekend; a job I’d taken on just before Christmas turned out to be much longer than expected so I had no choice. Taking a portion of the turkey curry I had in the freezer seemed like an easy option for my Sunday supper. But then as I wandered the aisles of Waitrose for a few things, en route to my morning coffee, alternative thoughts took hold. I like cooking. Cooking something special at the end of the day would, for me, be relaxing. 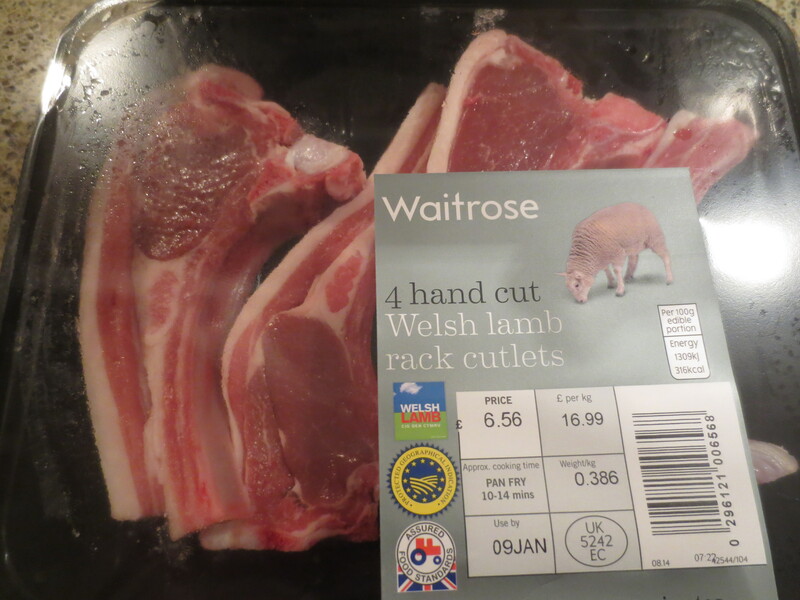 The pack of Welsh lamb rack cutlets reminded me of Jonathan and Lyndsey’s wedding 4 years ago – pre blog! Lyndsey is Welsh and wanted to get married in Wales. The venue just about made it: Llyndir Hall Hotel is in Rossett, a village between Wrexham (Wales) and Chester (England). 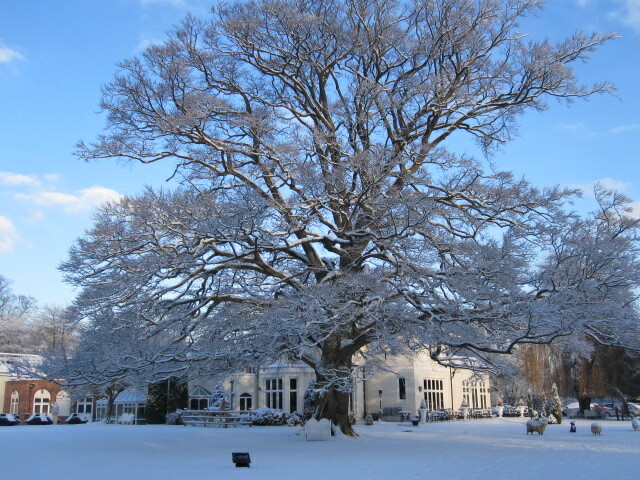 It was the year of The Snow – that thick, thick and heavy snow that arrived just before Christmas 2010. Their wedding was on 22 December. It’s a slight miracle that most of us made it. The groom and I headed up a day earlier than originally planned and the journey was quite terrifying: it was so cold that the windscreen froze over with snow as darkness fell, despite our ‘winter’ screen wash and heater turned full blast, and we had to keep stopping to scrape the ice off. The usual 3-3½ hour journey took well over 6 hours. But we got there. I had an unexpected ‘last night’ with my son before he married and we ate a lovely meal over a good bottle of wine and talked, just the two of us, before everyone else arrived the next day. And then, the day of the wedding the sun shone brilliantly. The wedding photos, in the lovely garden covered in thick snow, with a gorgeous clear blue sky in the background are the stuff made of fairy tales. The wedding breakfast (our meal) was superb and the main course was salt marsh Welsh lamb, cooked to pink perfection and completely wonderful. During the day, whenever I took a break from work, I scoured my cookbooks, my ideas changing all the while. This is the part I find fun: coming up with the final plan. 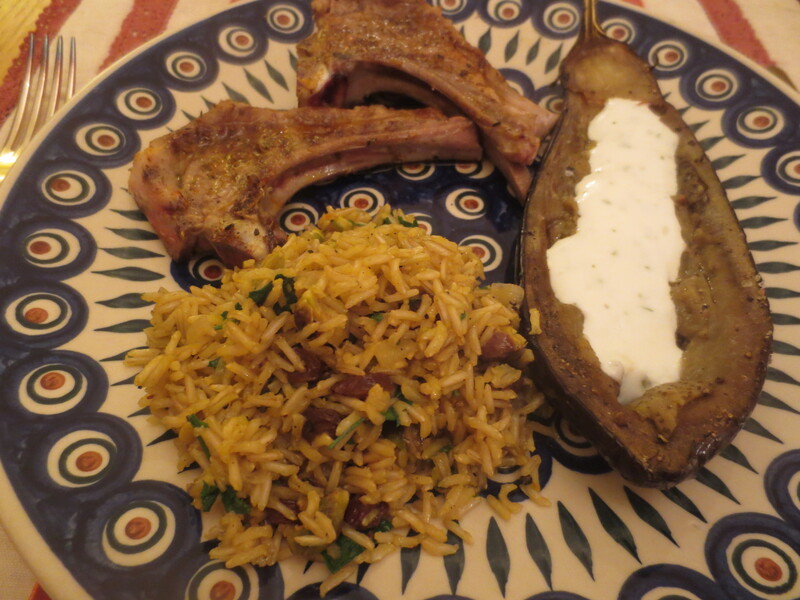 In the end, I put my own inclination of spices into a marinade for the lamb cutlets; the rice became a pilaf inspired by Moro the Cookbook but not strictly followed; and the aubergine became a little more exciting than just the addition of olive oil – it became Anodolu Patlican – baked aubergine with mint yoghurt – from Ghillie Basan’s Classic Turkish Cooking. 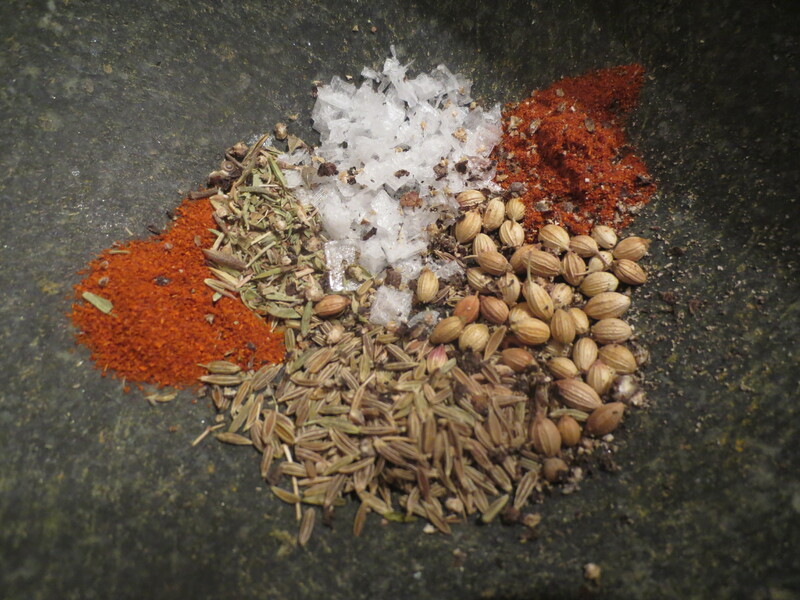 Into my pestle and mortar I put about a third teaspoon each of cumin seeds, coriander seeds, sweet paprika, smoked paprika, dried thyme and some sea salt and black pepper. I ground them together, tipped into a small bowl and added about 2 tablespoons olive oil and mixed. 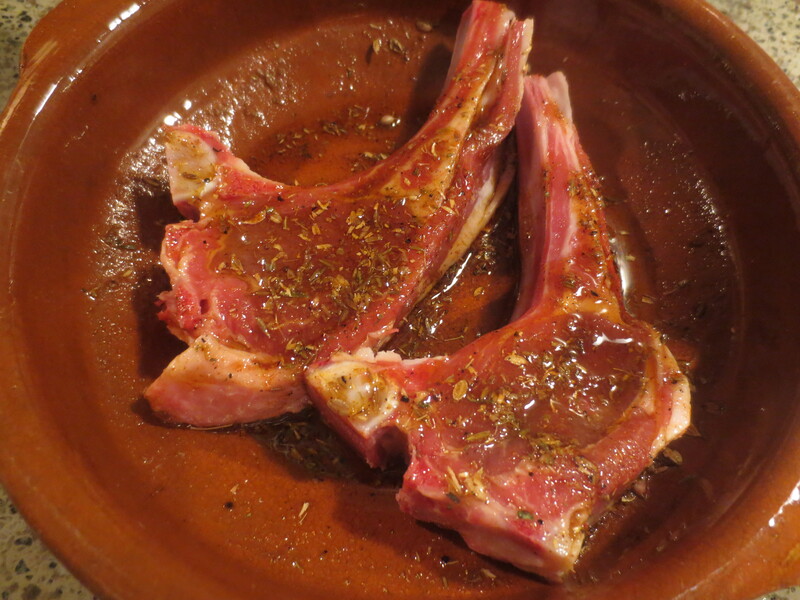 Then I added 2 chops and coated them thoroughly, leaving them to marinade for 2-3 hours. Make sure you allow at least an hour. 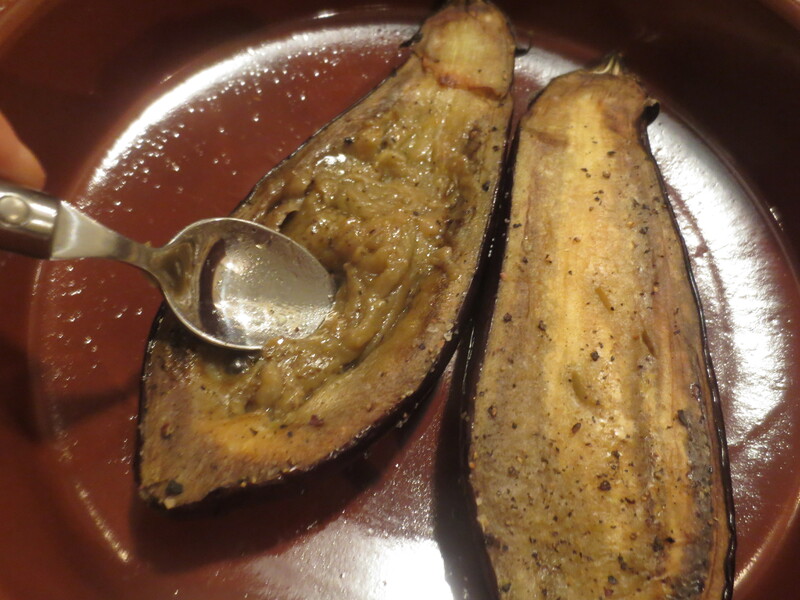 About an hour before I planned to eat, I cut an aubergine in half lengthwise, coated in olive oil, seasoned the top of the halves and put in a 200C/180 Fan oven for about 40 minutes – or until nicely soft and tender. 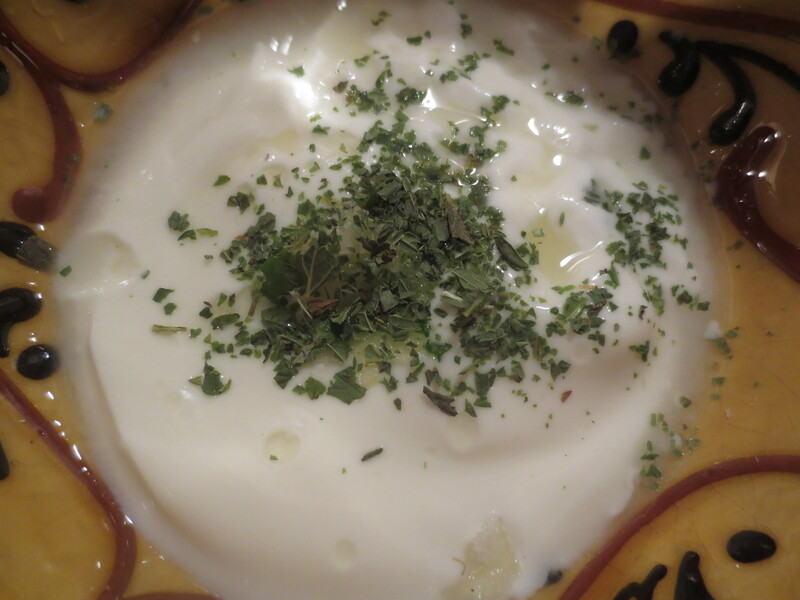 Meanwhile, I prepared the yoghurt sauce: a couple of tablespoons plain yoghurt into a bowl; a small piece of garlic crushed with some salt, a good squeeze of fresh lemon juice and about ½ teaspoon dried mint and mixed well together. The pilaf needs starting about half an hour before you plan to eat, though will keep warm for a little while in a pan with a lid left on. Finely chop a shallot and soften in about 1 tablespoon butter with ¼ teaspoon ground cinnamon. 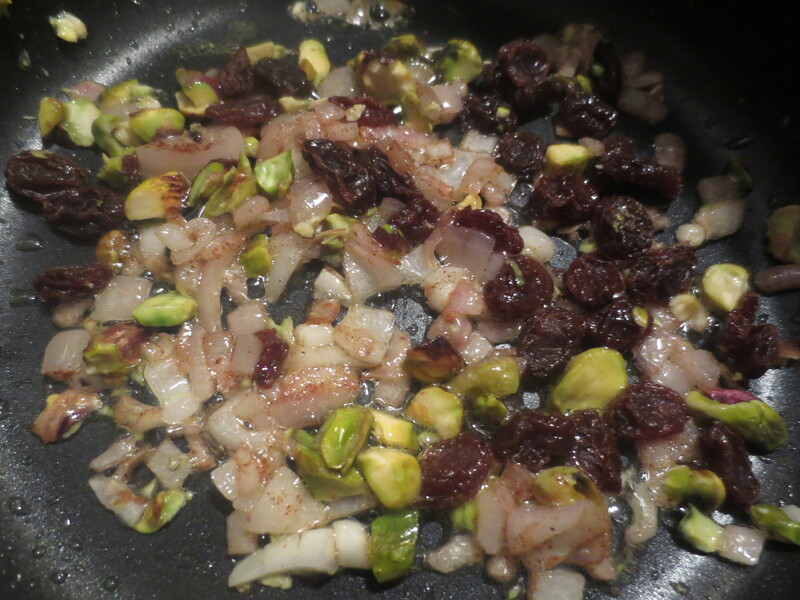 Add about 1 tablespoon pistachio nuts chopped and 1 tablespoon currants or raisins. Stir well. Add half a cup of brown basmati rice, stir to coat in the butter, then add a pinch of saffron that’s been soaked for a few minutes in a little hot water, 1 cup (twice the measurement of rice) of stock (light vegetable or chicken), salt and pepper. Bring to the boil then turn down to simmer with the lid on until all the liquid has been absorbed and the rice is tender. When it’s ready sprinkle over some chopped flat leaf parsley and mix in. 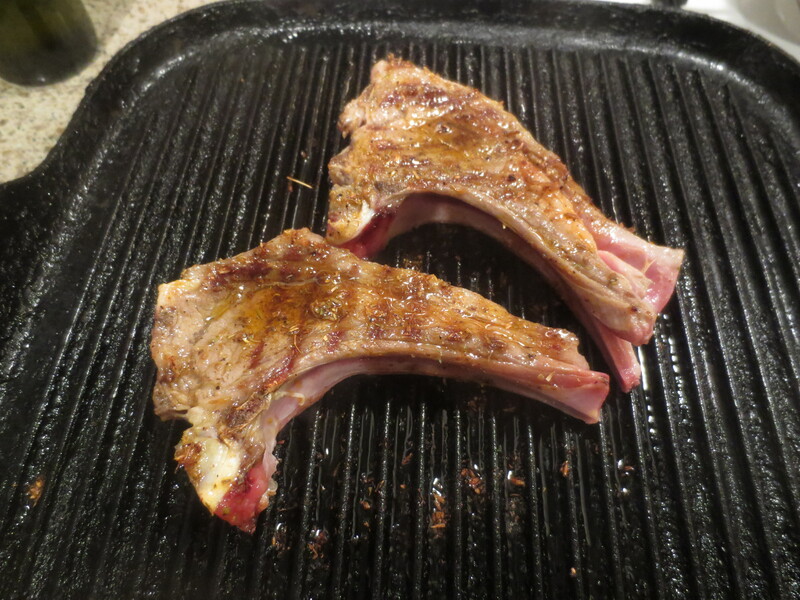 Cook the lamb cutlets on a hot griddle until nicely browned but still pink in the middle. Leave them to rest for a few minutes and meanwhile use the back of a teaspoon to crush the middle of the aubergine half (or halves if serving two people). Fill the pocket with the yoghurt mix. 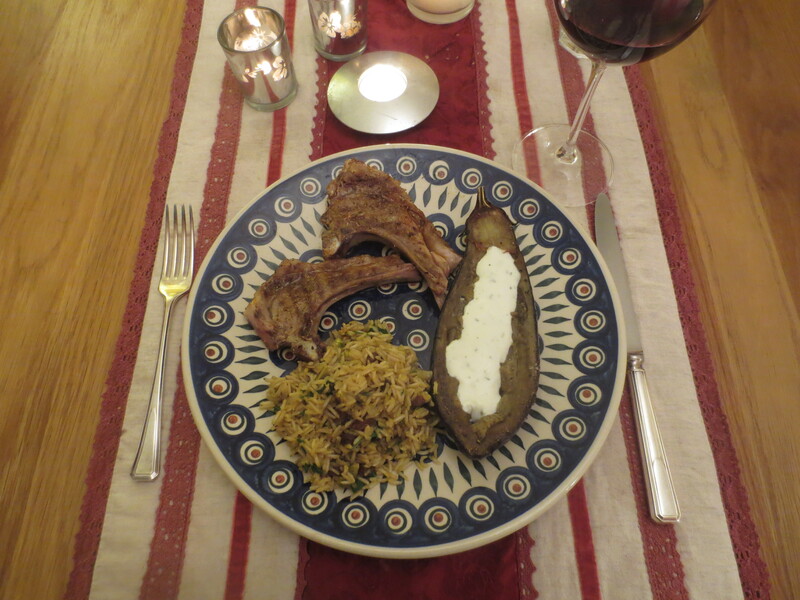 Now lay everything out on a plate: the griddled chops, the aubergine with yoghurt and some of the pilaf, and serve. It was SO good. I was very pleased I’d been tempted to those chops in the morning … and look where it led me! I love this kind of food: rich in spices, warm and earthy. 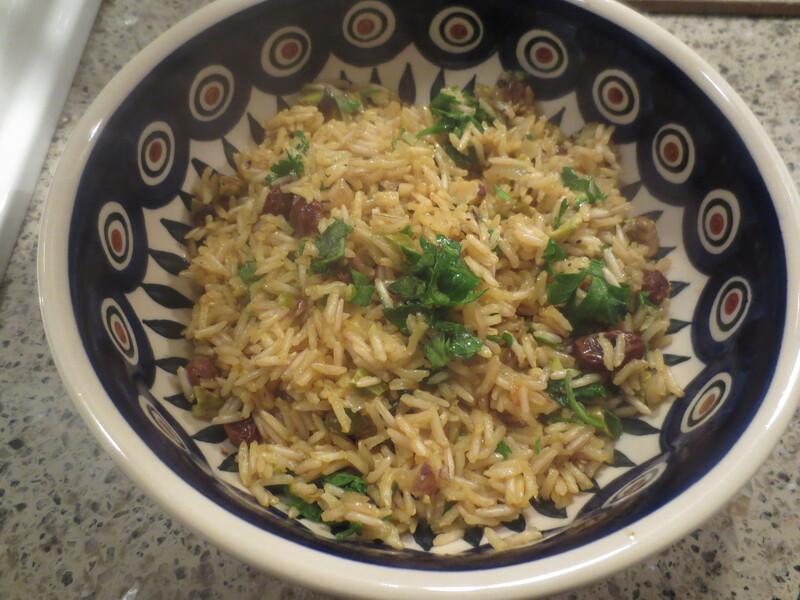 I played one of my favourite albums as I did the final cooking and while I ate: Ali Farka Toure & Ry Cooder’s Talking Timbuktu – and it brought a little more of a north African/East Mediterranean flavour into my evening. I love you snowy picture of whales, there was a light dusting of snow when I arrived in Germany during the holidays this year but it quickly turned into rain and slush. I can taste all the wonderful spices in your lamb dish I hope to make it soon. Thank you Gerlinde. We haven’t had snow in London this year – or yet! But it was very beautiful for the wedding in 2010. I hope you enjoy the lamb dish!